Cyril Kersh was born in London in 1925, the son of Hyman and Leah Kersh, and was educated at Westcliff High School in Essex. After leaving school, he worked variously for a newsagent, a wool merchant, and an illegal toy manufacturer, resisting his family’s attempts to make him settle down in his uncle’s bakery business. 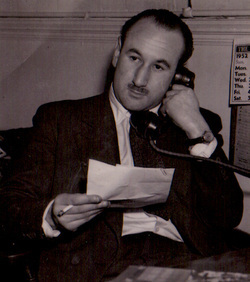 Kersh served in the Royal Navy from 1943 to 1947 and on demobilization pursued a career in journalism. He worked at various publications, including a stint as a feature writer for the Evening Standard and for three years edited Men Only. In 1963, Kersh joined the Mirror Group, where he would remain the rest of his career. He was features editor of the Sunday Mirror and editor of the magazine Reveille, eventually retiring in 1986 after being promoted to managing editor of the Sunday Mirror. Kersh was well known in the journalists’ bars of Fleet Street, which he would frequent wearing a bow tie and recounting humorous anecdotes. 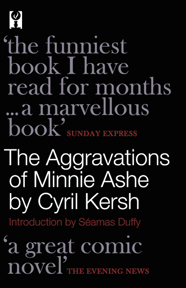 His keen sense of humour is on display in five novels published during the 1970s, of which The Aggravations of Minnie Ashe (1970) is the best known. Cyril Kersh died in 1993.